When you open templates or files using a hyperlink button or from Outlook's Shortcut navigation pane, you'll receive an unsafe hyperlink warning. You can disable the warning by editing the registry. You may also receive the file open or save dialog when using a hyperlink button or shortcut. To disable this dialog when the "Always ask" field is grayed out, run Outlook as administrator. The "always ask" checkbox should be clickable. If not, you'll need to edit the registry for each file type. See Disable "Always ask before opening" dialog for more information. The solution applies to all Office applications, not just Outlook. Add a registry value to disable the warning dialog. Note: If the Security key does not exist in your registry, you'll need to create it too. Right click on Security key and choose New, DWORD. 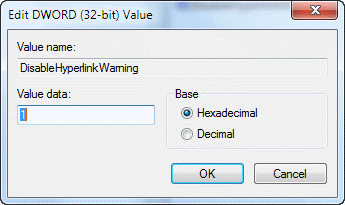 Type (or paste) DisableHyperlinkWarning as the Value name then double click on it. Enter 1 as the Value data to disable the warning. Delete the key or use a value of 0 to enable the warning. If you don't want to edit the registry yourself, you can download and run the following registry key for your version of Outlook. These files set the key in the User path. If you don't want to edit the registry yourself, you can download and run the following registry key for your version of Outlook. These files update the Policies path. just does not work for me ! Recently installed Office 2016 and i also had this very annoying warning with hyperlinks in an Excel sheet... This method works, though i had no 16.0 folder under Office in my registry... it went up to 15.0... so i created 16.0/Common/Security, with the Dword in it (32-bit, i'm running a 64-bit version) and voila, IT WORKED !! No more stupid warnings when opening hyperlinks from my own HD. you didn't have this path at all - HKEY_CURRENT_USER\Software\Microsoft\Office\16.0 ? Is this a new computer with a preinstalled version of Office? (That delivery method the OEMs use uses a virtual registry but reads most keys added to the traditional path). I am using Microsoft Access 2016 (Office365) . I have tried everything suggested by everyone to no avail. My database has internal hyperlinks (all within my computer). I can't get rid if that damn warning. HELP if you can. Are you using 32 or 64 bit office? Which suite is it - consumer subscription, business/E subscription, or retail? Did you use the policies key or the one under the normal office path? Try the other one. did you use the 'do it for me' for outlook 2016? Hi Diane. I have Office 2016 and Windows 10. I used your "Do it for me" file and it I keep getting a warning for this "C:\Users\Skip\AppData\Roaming\Microsoft\Templates\Skips Outlook Templates". The registry file has been changed because I checked it. Will you please help me? 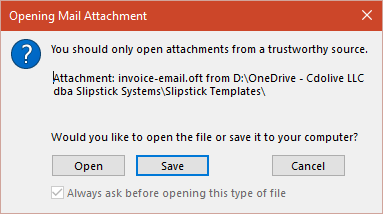 Add the template folder as a trusted location in file, options, trust center. I'll check it - it should work. Did you restart Outlook? When using policy keys, you need to restart outlook. It's working here - i'll update it with a ready-to-use reg file. I have been annoyed by these warning for over two years.